File Name: David L. Katzenbogen of Hibbing, Minnesota. Notes: Hibbing is an iron mining town in the northeast part of the state, about 75 miles northwest of Duluth. It is also the hometown of Tripwire. 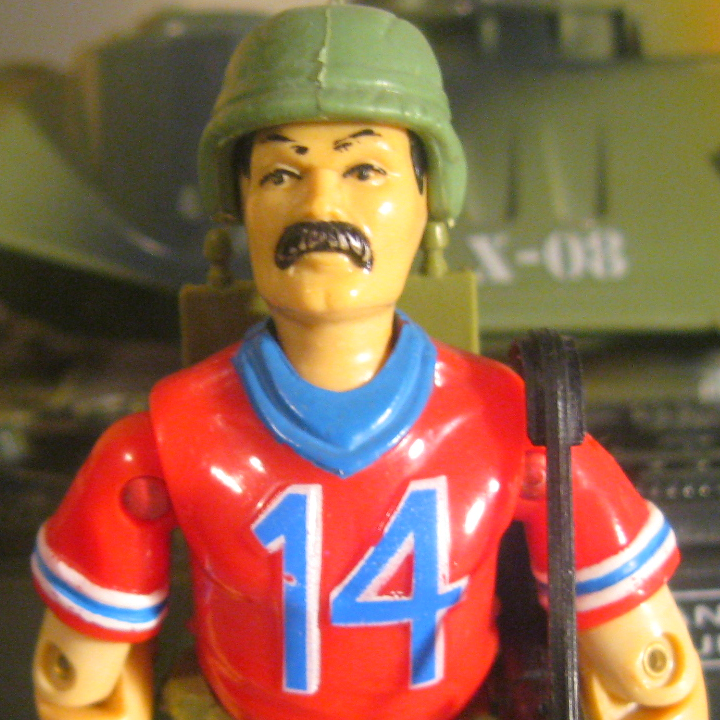 Sunbow's Bazooka wore his 1985 outfit with tan pants and helmet, and brown wristbands. He was usually paired with Alpine. Despite the filecard description, the series placed Bazooka in the mythic role of "loveable goof," and he rarely spoke in complete sentences. Bazooka's file name was mentioned in the episode Worlds Without End, Part 1. Excalibur 4 seconds (silent) setting up radar system; hit by tidal wave; driving W.H.A.L.E. Season 2 Opening (Sunbow) 5 seconds (silent) driving A.W.E. Striker and Silver Mirage, destroying B.A.T. Accessories: black M72 LAW missile launcher with sling and visible missile tip (new), olive helmet with engraved brim strap, olive backpack with four engraved missiles. Bazooka was driving an Abrams tank in the "Third Horde" (Third Armored Div.) when he came to the realization that an illiterate farmer armed with a $200 disposable rocket launcher could knock out a million dollar tank with less than two weeks training. He put in for a transfer immediately. Training: Advanced Infantry School, Fort Benning; Armor School, Fort Knox. Qualified expert: Dragon Anti-Tank Missile, Milan System, LAW rocket, Recoilless rifle, LAW System and all Warsaw Pact RPG systems. Subject is also EOD (Explosive Ordnance Disposal) qualified up to the tac-op category. Subject is a decisive fast-thinker with all the instincts of a natural survivor. Variations: Early figures (most or all of 1985) had a thicker, less detailed LAW missile launcher that also came with Footloose. Bazooka's belt could be either cream-colored or a bluish green. Reissued: Reissued in mail offers 1988-1992 (North Atlantic, Operation Blackout, End of Slaughter, Top Secret, Thrills Chills Spills, G.I. Joe Bugle, Mission Rescue: Code Blue). Accessories: black missile launcher (85 Bazooka's), red-brown helmet (85 Bazooka's), dark green backpack (85 Bazooka's). BAZOOKA was driving an Abrams tank in the "Third Horde" (Third Armored Div.) when he came to the realization that an illiterate farmer armed with a $200 disposable rocket launcher could knock out a million dollar tank with less than two weeks training. With that in mind, he put in for an immediate transfer to Tiger Force. Since that time, Bazooka has become a true specialist in the use of tactical assault missiles. Now, he can fire a surface-to-surface missile at a T-52 tank positioned over 2 miles away and blow off its gun barrel cleaner than knife through butter! "Bazooka can tell you everything you need to know about missile attack systems, and then some! He'd talk your ear off if he wasn't always on the missile range target shooting. He never lets his missile launcher out of his sight, even when he goes for a joy ride in the Tiger Shark through Cobra infested waters. He really lives by the words, 'Be prepared for anything!'" Accessories: light green submachine gun (88 Hit & Run), light green rifle (90 Ambush's), light green machine gun (91 Big Ben's), teal spring missile launcher with shoulder notch and U-shaped handle, red trigger (new), two light green spring missiles with tapered ringed tip (new), light green figure stand (common). BAZOOKA has been all over the world driving an Abrams tank with the "Third Hord" [sic] (Third Armored Div.) against Cobra forces. Extensive travelling made Bazooka homesick and long for his favorite hobby: fishing. Whenever he has to fight, the memory of home sends him raging into battle...and that's no fish story because he's one angry dude you DEFINITELY want on your side when the action heats up! Bazooka has trained at the Advanced Infantry School at Fort Benning and the Wildman Fishing Academy back in Minnesota. Motto: "When I explode into battle against those puny Cobra Vipers, it's like shooting fish in a barrel!" Toy Notes: Item #6861. 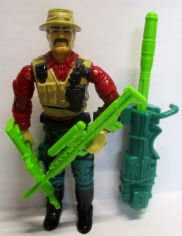 Though Bazooka was one of the first 1993 figures released, the Blockbuster was not released until spring 1994. Accessories: dark olive helmet with helmet cam and black goggles on brim (new). A trained tank-driver himself, SGT. BAZOOKA knows exactly what the COBRA armored vehicle drivers are thinking as they jink and weave to avoid getting hit by his missiles. Knowing what the best evasive maneuvers are helps him to second-guess the moves of COBRA vehicles and keep them targeted in his sights. He knows that having the skill and knowledge to aim and fire his missiles is only half the job; the weapons have to be hand-carried to the firefight and missile systems, even supposedly hand-portable ones, are bulky and heavy. This means extra physical training, a ten-mile run every morning, and a strict schedule of weight training to maintain his strength and stamina at peak levels. "A wire-guided missile and a night-tracker weigh 46 pounds. A reload weighs 26 pounds. Do I mind having to work out an extra hour a day to stay in shape to carry a reload in case my first shot misses? Negative!" Accessories: grey revolver with curved grip (new), grey spring-loaded bazooka with handle on top and grip and trigger guard near front (new), grey spring missile, thick tip with three rings in middle (new), green helmet with black goggles (04 Sgt. Bazooka's). A trained tank-driver himself, SGT. BAZOOKA knows exactly what the COBRA armored vehicle drivers are thinking as they maneuver to avoid getting hit by his missiles. He knows the best evasive moves; this helps him to second-guess COBRA vehicles and keep them targeted in his sights. SGT. BAZOOKA knows that having the skill and knowledge to aim and fire his missiles is only half the job; the weapons have to be hand-carried to the firefight and missile systems, even supposedly hand-portable ones, are bulky and heavy. This means extra physical training, a ten-mile run every morning, and a strict schedule of weight training to maintain his strength and stamina at peak levels. Toy Notes: Carded in a two-pack with Dreadnok Torch. Item #00279. Accessories: black M72 LAW missile launcher with curved shoulder rest and tan sling (new), four short silver missiles on cylindrical base, each with four slight fins (new), light green helmet with grey band on chinstrap (new), tall green backpack with four slots for missiles (new), black Joe figure stand. SGT. BAZOOKA was driving an Abrams tank in the "Third Horde" (Third Armored Division) when he came to the realization that an illiterate farmer armed with a $200 disposable rocket launcher could knock out a million dollar tank with less than two weeks training. He put in for a transfer immediately. Training: Advanced Infantry School, Fort Benning; Armor School, Fort Knox. Qualified expert: Dragon anti-tank missile, Milan anti-tank missile system, LAW rocket, recoilless rifle, LAW system and all Warsaw Pact RPG systems. He is also EOD (Explosive Ordnance Disposal) qualified up to the tac-op category. "SGT. BAZOOKA is a decisive fast-thinker with all the instincts of a natural survivor."